◆ Adopt advanced (IGBT) Inverter control technology, with high duty cycle and efficiency. ◆ Minimum Size, light weight, high quality construction and energy-saving. ◆ Use PWM control technology and Constant current output control, welding current can be exactly controlled. ◆ Easy arc-starting, with Auto protection functions of over-current and over-heat. ◆ Excellent arc characteristics, stable arc, good welding performance, less splash & noise. ◆ With Anti-stick, Hot-start, Arc-force, and strong compensation capability. 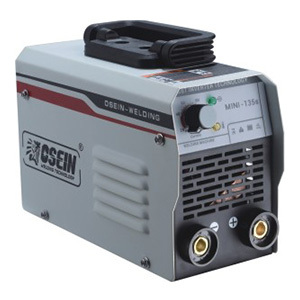 ◆ Suitable for welding all kinds of materials, such as carbon steel, alloy steel, cast iron and stainless steel etc. ◆ With Complete accessories: Electrode holder, earth clamp, welding cable, brush/hammer, protective mask.